The fundamental inspiration for both projects came from physical surroundings of the family farm where I grew up. At the time of Blue Dreams I was intrigued by the beauty of slow motion decay and decomposition many disused barns were undergoing (and continue to do): rusting roofs, peeled paint, weathered wood, bent rebar, piles of orange twine knotting together, entire barns leaning impossibly far but not falling. Silo Songs was developed entirely inside one of the buildings on the farm- a large concrete grain silo, completely empty since the 80s. Silo Songs was a slow accumulation of ingredients that eventually clarified itself during the four years I spent workshopping ideas inside the silo. Silo Songs bears little musical resemblance to my solo album Blue Dreams aside from the continuity of multiphonics, a world that I obsessed over and lived within for several years. Blue Dreams was conceived early on in my immersion into through-composed and through-performed multiphonics pieces, and it was recorded during my most prolific stage as an improviser when I was living in Oakland, California. Free improvisation is another area that I focused on for several years, particularly in the Bay Area, where I was in close proximity to a hotbed of creative musicians with open minds and gigantic listening ears. I long to saturate myself once again in that world, playing as I float along the stream of consciousness, and i look forward to reuniting with improvisation sometime. As to recording Blue Dreams, I gave myself 3 hours in a gorgeous studio-all wood and dim lighting with a fantastic audio/sound engineer/percussionist/improviser (Karen Stackpole) who I knew would give me the psychic space I needed to improvise crystal clear ideas. My sole focus was representing what I heard/saw/thought/felt from the collective stream of consciousness in the form of multiphonic trombone pieces/songs. In the weeks prior to the recording, I sketched out a basic harmonic form for three or four pieces, and played multiphonics daily to build endurance. Recording Silo Songs was a completely different experience. For starters, I spent several years working out the physical and technical kinks of playing outdoors in various temperatures. I was also living and working in New York at this point. Economically, the silo project all had to be done by myself – there’s no way I could have hired someone to travel out to Jonesville Michigan every time I experimented. Besides, I vehemently believe that my personal and psychic space needed to be uninterrupted by others. As an individual who is influenced by others to a disturbing degree, I struggle to hear my own thoughts. In order to make artistic decisions unfettered by the ideas and opinions of others, I must honor my need for solitude, the chameleonic Pisces that I am! So there I was, learning how to be a field recording engineer, while also assessing the acoustic phenomena of the space for what pitch sets would be optimal, and testing out how other found objects and instruments reacted in the space. Eventually (in the final year), I was also thinking about the mechanics of actually playing trombone in such an unlikely performance space. Within real life this recording project was one of many varied performing and related projects. Having many irons in the fire (professional, personal, and otherwise) tends to keep me alive and focused – I thrive on a plurality of identities! Silo Songs could have been done in a month’s time, but the beauty of spreading it out is that it had time to marinate and simmer alongside other projects like commissions for Loadbang and The Fourth Wall, and writing my book on Multiphonics. My work in the silo was done at times of the year when performance seasons have a lull, like February, early July, August, and so on. It worked out rather seamlessly with my “regular” NYC life. I’d like to think that is because I spend a lot of mental energy manifesting – in this case, manifesting an ideal schedule that doesn’t cause any outrageous double bookings. It more or less worked out. What inspired you to write Hooked on Multiphonics? What were your original goals with the book and how do you feel now that it has been out for a little while? I remember in 2011 noticing how often I had to repeat myself to composers who wanted to write extended techniques for trombone. “Why don’t these people learn more about the mechanics of the trombone in school,” I thought. Or, “if you’re so interested, why don’t you look it up?” But when I looked around for resources to point them to, no text or resource really gets granular and specific enough to convey what the trombone can do. So then I thought I’d just make a quick sheet or two of musical examples to hand over to any composer interested in my instrument…well, that quickly exploded into multiple chapters, and eventually into a two part book, because trombonists need to understand the mechanics of multiphonics as well, and tricky passages could be made easier by having some studies to practice. I’ve heard good things from both composers and trombonists who are using/have used the book. Personally, I’m still editing the book in my mind. I think the process of making the book exacerbated my inner critic and perfectionism has now run rampant in my life. I’m gently swinging the balance back toward spontaneous fun and play in my musical life. Do you think we have a specific role or responsibility as female brass players? How do you incorporate that (or not) into your own life as a musician? 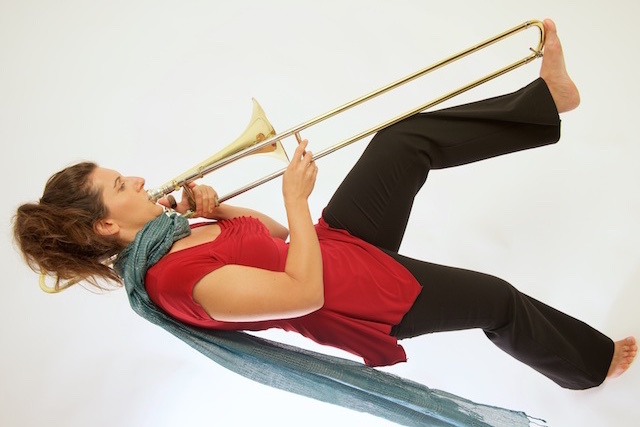 What does it mean to be a female brass player? This is a really small club, one that’s so small most of its members didn’t even know there were any others in it! I certainly didn’t. Being a female brass player for me has meant taking a “joke” that isn’t very funny and is demeaning to women; walking into a room of colleagues having “locker room” talk and quickly dwindling down to a murmur when you enter; or worse, having locker room talk right there in front of you and expecting you’ll just be cool about it; having to relate outside of yourself in order to “get” male humor, and if you’re hetero, dealing with the complexity of human attraction with an awkward proportion of “date-ables.” And a lot of other stuff. In other words, the ratio of men to women in brass world is tricky to navigate, even for a tomboy at heart like myself! I think as human beings, we all have a responsibility to one another to keep one another in check by our own sense of (hopefully) good ethical/moral/professional standards. As a population, we will evolve more constructively if we all pitch in, and this is how communities become strong. So to break that down into a smaller sector- the responsibility a female brass player has – it isn’t any different. At least not to me. We are all responsible for our community and subcommunities that we identify with, whether we actively participate or not. We do this face to face, at jobs, after hours, on the train, social media, and on the rare occasion we can get out of our spheres and do something non work related. I’m still working on being better at participating in my communities-especially in the non work, friend hanging portion. It’s a long term project and we can all choose how we contribute to it. Do you see any specific challenges for musicians in today’s climate? How do you mitigate those on your own or in your teaching? Well, more than ever, if you want to be a musician, it had better be a huge passion, and you’d better not be worried about stability…and if you are thinking about stability, then music is just simply not a good career choice. The hardest thing for me to do as a musician is to have fun and remember that I do this because I love it (I really do love it). And make space-psychic, physical, emotional, mental – to create!! Creation is left out of a lot of music education- it’s up to YOU to put creative tasks back into making music! Is there anything you wished you had known as a student or young professional that you know now? Any advice that you’d like to share with younger female musicians? I wish I’d known social skills were an integral part of life and of music and of freelance musician work in particular. Secondly, I wish I’d been trained in sight reading and switching quickly between style/articulation more rigorously and to understand how important that is! Any resources you recommend? Books, podcasts, recordings that changed your life, etc?